The cycling chamois is designed respecting the anatomy of the human body and the areas to protect, based on the posture assumed by the cyclist and according to the discipline practiced. Just as you choose a different bicycle depending on the kind of cycle route you want to tackle, you must also consider wearing the most suitable chamois. A mountain bike in fact is completely different to a road bike, under many aspects, starting from the geometries of the chassis and consequently the posture the cyclist needs to assume in order to ride the bike. Within each category (road, mtb, urban, crossover, triathlon, training and kids) it is possible to identify different models, all with specific riding postures. Each requires a specific padding; therefore, it will be important to choose the right chamois! The cycling pads designed for time trial racing, for example, use super-high density pads placed in the front part of the chamois where the greater pressure of the body is concentrated, while those designed for mountain biking provide greater support in the rear area, to best support a more relaxed posture for longer hikes. When you purchase your bicycle seat pads, you must carefully consider the posture you will assume once you are on the saddle. It would be helpful if you could try the chamois by sitting on the saddle; if that is not possible, you could try simulating your posture when you cycle, so as to have an idea of where the padding can favour the movements of your body. The products made with specific characteristics for racing, time trials or triathlon have high density protection in the perineal area, towards the tip of the saddle: this is where pressure peaks occur because of the typical aerodynamic posture and the energetic and frequent pedalling. 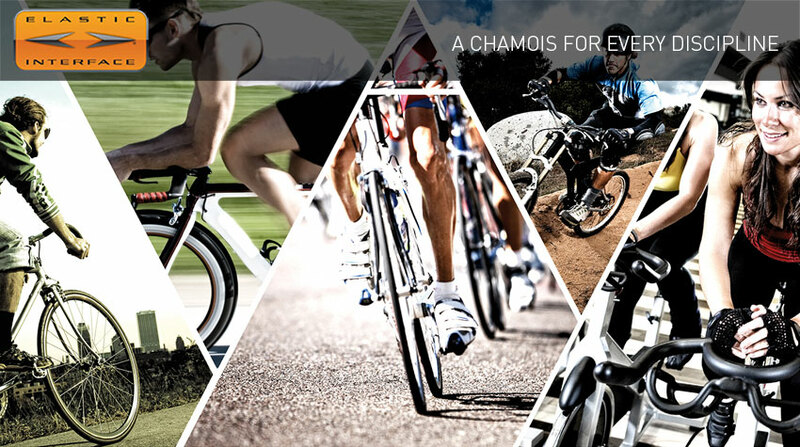 In races or events that exert the athlete, it is crucial to have a high performance chamois to guarantee excellent stability and comfort, to avoid an uncomfortable ride that causes loss of concentration and ultimately precious seconds. For this reason, the design of the chamois for ROAD PERFORMANCE, TT PERFORMANCE or TRI COMP is essential and tight fitting. When riding a mtb, the cyclist’s body is less forward leaning than that of one riding a performance bike, and consequently it applies greater pressure on the back part of the saddle; the rough terrain also increases the risk of bumping and rubbing. This is why Elastic Interface® chamoises like MTB SPORT or CROSS PERFORMANCE, designed for off road terrain, have special, high density pads in the ischial area, positioned specifically to optimize comfort and performance on all types of terrain. Also to consider are the fast-dry fabrics, which can guarantee optimal breathability even on the steepest climbs or in the most demanding descents. We should not, therefore, underestimate the importance of correct sportswear for cyclists, whichever activity you’re planning to tackle: be it indoor training, road cycling in town, hikes in the woods or triathlon races. In all these activities one tends to sweat a lot: sometimes we often change posture on the saddle, other times instead we maintain the same posture for hours. It is therefore necessary to wear suitable cycling pads that are sufficiently elastic to easily adapt to the movements of the body and with sufficient breathability to help drying. Elastic Interface® cycling protection pads are custom designed for the different activities, guaranteeing maximum comfort: bicycle riding will never have been so pleasant. Find your best chamois!